The watches in the special edition Omega Spectre series, a Seamaster 300 and an Aqua Terra 150M, are highly coveted among collectors. They can withstand magnetic fields up to 15,000 Gauss and are certified as Master Co-Axial Chronometers. 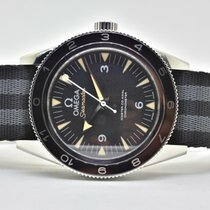 Omega has been supplying James Bond with watches since 1995. In the 1995 film GoldenEye, Bond wears an Omega Seamaster Diver 300M with a blue dial and bezel. This blue Seamaster suits Bond—a secret agent, gentleman, diver, and sailor, all in one. Twenty years later, in 2015's Spectre, he sports an Omega Seamaster 300. This retro watch has a design inspired by the original Seamaster 300 from 1957. 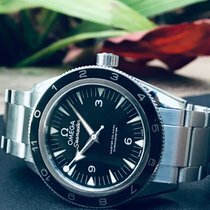 Omega offers two limited edition watches for collectors and Bond fans: the Seamaster 300 Spectre and the Seamaster Aqua Terra 150M Master Co-Axial Limited Edition James Bond Spectre . Both models feature state-of-the-art technology. For example, they are resistant to magnetic fields up to 15,000 Gauss. Omega also subjects them to a test that is even stricter than that from the Official Swiss Chronometer Testing Institute (COSC), which they developed in cooperation with the Swiss Federal Institute for Metrology (METAS). Therefore, the watches are inscribed with the words "Master Co-Axial Chronometer" on the dial. In 2017, Omega released the Seamaster Diver 300M "Commander's Watch" Limited Edition . This model pays homage to the Royal Navy. It shares the same white, blue, and red color scheme as the flag of the United Kingdom. Limited to a run of 7,007 pieces, this special edition also draws inspiration from James Bond's rank as a Commander. A blue, red, and gray NATO strap keeps the watch securely on the wrist, even under extreme circumstances. Omega ships a stainless steel bracelet and a tool to change the armband with every timepiece. The Omega Co-Axial caliber 2507 powers this Bond watch and can be viewed through the sapphire glass case back. Its rotor resembles the casing of a 9-mm bullet and is particularly eye-catching. 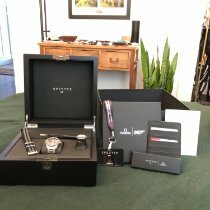 How much does an Omega Spectre cost? If you're a James Bond fan and want to emulate the master spy, the Omega Spectre models – the Seamaster 300 Spectre and the Aqua Terra 150M James Bond Limited Edition – are perfect choices for you. The Seamaster 300 Spectre is a bit sportier with its rotatable bezel and NATO strap. The watch has a retro look and goes just as well with a suit as it does with a casual polo shirt. Actor Daniel Craig proved this in the film. 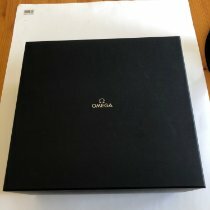 This Omega Spectre is limited to a run of 7,007 pieces and has a list price of 7,500 USD. Within a few months of its release, prices had already begun to increase rapidly. Today, a never-worn example demands around 10,100 USD. Pre-owned pieces are only slightly less expensive at about 9,500 USD. 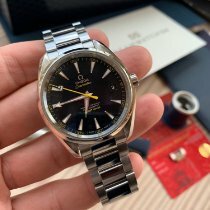 With a run of 15,007 copies, the Omega Seamaster Aqua Terra 150M James Bond Limited Edition is much more common than the Seamaster 300 Spectre. You can purchase this watch for around 6,000 USD new and 5,200 USD pre-owned, both well under the original list price of 7,350 USD. If you're looking to buy a James Bond watch as an investment, the rarer Seamaster 300 Spectre is a better bet. The Omega Seamaster Diver 300M "Commander's Watch" from 2017 also had a run of 7,007 pieces, just like the Seamaster 300 Spectre. You can purchase this timepiece for just under 4,800 USD in mint condition and 4,400 USD pre-owned. It has an official list price of 5,000 USD. Only seven gold copies of the Diver 300M "Commander's Watch" exist. Accordingly, its price is much higher. Plan to spend over 30,200 USD on this timepiece. The Omega Seamaster 300 Spectre is one of the most highly coveted models in the Seamaster collection and a worthwhile investment. Its design is very similar to the standard model, with only a few differences. The numbers 0 through 11 on the bezel immediately catch the eye. They are made of Liquidmetal, an amorphous metal alloy that is more resistant and elastic than titanium or aluminum alloys. The bidirectional bezel allows you to keep track of the time in a second time zone by synchronizing it with the hour hand. The normal version, on the other hand, has a unidirectional bezel with a 0 to 60 scale. This is a classic diving watch characteristic. Before you start your dive, you turn the bezel so the zero marker is aligned with the minute hand. This way, you can keep track of how long you've been underwater. Both models feature thin, long, triangular index markers, similar to those on the first Seamaster 300 from 1957. Also similar to the original, Arabic numerals are at 3, 6, and 9 o'clock; the only difference being the 1957 version featured a numeral at 12 as well. The Spectre edition features the company name and logo where the 12 would have been. Both models have an arrow-tip hour hand, but the second hands differ. The standard Seamaster has a triangular tip, while the Spectre edition has a " lollipop hand " with a circle on the tip. The most noticeable feature of the Spectre watch is its gray and black NATO strap. James Bond has been wearing NATO straps since the 1964 film Goldfinger, when Sean Connery sported one. In close-up shots, you may notice the 18-mm strap was too slender for the Submariner's lugs. The automatic caliber 8400 powers the Omega Spectre. Special features of this movement include its Co-Axial escapement, an alternative to the Swiss anchor escapement. A Co-Axial escapement is synonymous with precision and efficiency. The balance wheel vibrates with a frequency of 25,200 alternations per hour (A/h). Omega built an anti-magnetic silicon balance spring, resulting in a movement unaffected by magnetic fields up to 15,000 Gauss. Two barrels create a long-lasting power reserve of 60 hours . Following in the footsteps of their historical predecessors, Omega passed on adding extra functions to the caliber. After being given the watch in the film Spectre, James Bond asks Q if it can do anything. Q answers, "It tells the time." The Seamaster Aqua Terra 150M James Bond Limited Edition is the other special edition watch in the series. This 41.5-mm diameter timepiece is limited to 15,007 copies. The dial features the Bond family coat of arms repeatedly interlocked, creating a unique pattern. The coat of arms is also found on the tip of the second hand with black outlines and three yellow dots in the middle. The family motto is "Orbis non sufficit"—the world is not enough. Fans know this phrase from the 1999 film of the same name and the 1969 film On Her Majesty's Secret Service. The caliber has a special oscillating weight which was designed to resemble a gun barrel with a bullet in the middle, similar to the "gun barrel sequence" in the opening credits of every James Bond movie. Similar to the Seamaster 300 Spectre, the Aqua Terra 150M is also resistant to magnetic fields up to 15,000 Gauss thanks to its anti-magnetic silicon components. Omega's 8507 caliber contains a Co-Axial escapement and is certified as a Master Chronometer. In order to be certified, the watch's precision, water resistance, and resistance to magnetic fields must be tested. The date display is at 3 o'clock and sapphire glass allows a clear look at the dial.